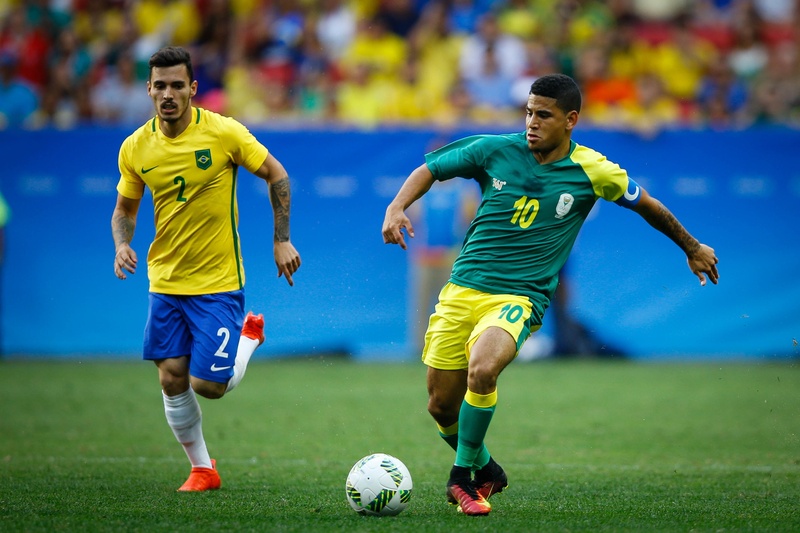 After a bright start to their Olympic campaign when they held Brazil 0-0, South Africa left the competition in disappointing fashion after holding a dominant Iraq to a 1-1 draw at the Corinthians Stadium in Sao Paulo. Needing a win to progress to the quarter-finals, South Africa got off to the perfect start when Gift Motupa slotted home from close range after six minutes. The goal came wrapped with a huge slice of luck, which was to prove a valuable ally throughout the game, when Andile Fikizolo’s cross rolled neatly into Orlando Pirates midfielder’s path off the back of Iraq defender Suad Natiq’s head just inside the six-yard area. Stung by their early setback, the junior Lions of Mesopotamia took the game by the scruff of its neck and dominated the rest of the encounter with enterprising play that made the South Africans look like a motley crew that had been picked up off the street en route to the stadium. Iraq captain Saad Luaibi duly equalized in the 14th minute with a cannon of a header at the near post from a corner, profiting from a sustained spell of pressure on Itumeleng Khune’s goal. The Asians, semi finalists in 2004, cut open South Africa’s defence at will throughout the game as Owen da Gama’s side battled to keep their enterprising opponents at bay. It was a combination of a blinding reflex save by Itumeleng Khune from an Ali Hosni Faisal shot just before half time and the upright, which may as well have been dressed in South Africa’s yellow and green, that prevented Iraq from scoring the goals they deserved. The post came to South Africa’s rescue on no fewer than four occasions as the Iraqis laid siege on Khune’s goal. Yet substitute Thabiso Kutumela could have sneaked a dramatic injury time winner when he fired wide from close range after a good run down the right by Abbubaker Mobara. Brazil, courtesy of their 4-0 rout of Denmark topped the group to set up an all-South American clash with Colombia while the Danes face Nigeria. In the remaining quarter-finals Korea meet Honduras and Germany play Portugal. That was very disappointing play, defending 90mins , I think 2 shorts at goal for the entire match, saved by Khune again. There was absolutely nothing they did right. We played with no strikers who can score goals. So why are we surprised at thd goalless draw! We went to Rio to draw and pray others offer us favours. Motupa coetzee dollie mvala stars in the making.